I pictured the heartwarming scene as we chatted with Diana, the Head Chef at The Avenue Cookery School, and one of Obby’s most loyal ambassadors. The school only moved into their new kitchen in South West London a couple of weeks ago, but you wouldn’t know it. With the doors always open, locals already seem perfectly comfortable popping in like old friends for tea and – if they get the timing right – a slice of cake. I get the impression that’s exactly how Diana wants everyone to feel here. Totally at home, welcome, relaxed. There’s none of that pretence of formality that you might expect from a cooking school; The Avenue is – like its owner – lively and fun. Chef tells us this reflects a shift in the way we ‘do’ food. Although Diana refuses to eat at a restaurant with bad wine glasses (I hear she’s quite the connoisseur), she sees food first and foremost as a way to communicate. Meals are about getting together in a relaxed environment, so dinner parties are becoming a remnant of days gone by. They’re all lipstick and dressed up tables. They’re fake. But at supper, that’s where people let their guard down. She tells me that getting your friends together for a casual supper is the new way to put yourself in the centre of your social group. Invite everyone over, whip up a spicy ratatouille with a fillet of sea bass (I’m assured this is easy!) and tell your friends to bring the booze and pudding. In The Avenue’s longer cookery courses, the teachers will get you to work without a cookbook for the first week. I wondered if that might be a bit daunting for fresh faces, but then Diana tells me that’s how you learn to cook. Removing the instructions gets you thinking about what you’re actually doing. I suppose that’s true for anything you learn. Precise boilerplates like recipes have limited value compared to developing a deep understanding of how combining ingredients changes textures and flavours. Once you get that, cooking becomes intuitive. And way more fun. It’s a simple matter of playing with the balance of onion, garlic and tomato until you can taste that you’ve made yourself a great sauce for that lasagna. This is what the team at The Avenue wants to teach us all. And it starts with the basics. I’m guessing no one’s ever taught you how to do your food shopping. I’ve certainly never had a shopping lesson. In fact, it’d never crossed my mind before meeting Diana. This is why food wastage has become so commonplace, despite being awful for both the environment and one’s bank balance. Whilst I can barely eliminate wastage on a personal level, this talented chef somehow manages to sustainably run a cooking school with zero waste. The key, I’m told, is learning to plan. It must come across by now that taking a class at The Avenue is about much more than being taught to make a few dishes. Beyond the kitchen counter, Diana tells stories about her students finding their confidence, developing a better understanding of their health, and even feeling happier in themselves. She talks about the 45 year old doctor, who didn’t even know how to make tea a few months ago, and now leaves every lesson excited for the next. A couple of dyslexic students who’d always felt excluded from making food because they struggled to follow recipes. And the teenager with depression who told her he’s never been more happy than in these classes. She’s even using her influence to give back to the London community, talking to groups of sixth formers in schools about wellbeing, healthy eating and keeping fit. I’m not sure how she finds the energy, to be honest, but it must have something to do with those early morning gym sessions. And of course the support of a great team that includes her son, Richard, who’s also a chef, and daughter, Sophie, who’s taken over all the PR and marketing. They might not have the time to sit down for a meal together these days, but I get the impression that food is still very much a family affair for The Avenue. We’re all good friends here. Your next Obby Teenage-Diana used to devour cookbooks like novels. She collected menu cards for fun. I think it’s fair to assume that she’d have been pretty damn excited for the future if she were able to see where that love of food would someday take her. 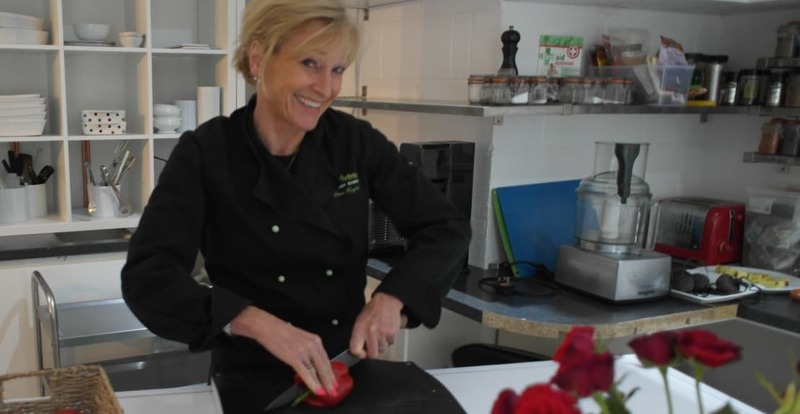 Next time you’re in Wandsworth, pop into The Avenue Cookery School to see how Diana took a personal passion and made it her life. And if you’re ready to take the plunge yourself, sign up for a cooking class and embrace your new hobby!